People say that wine improves with age. That’s not the case with sourdough bread, but it’s still pretty neat to eat something produced long ago. 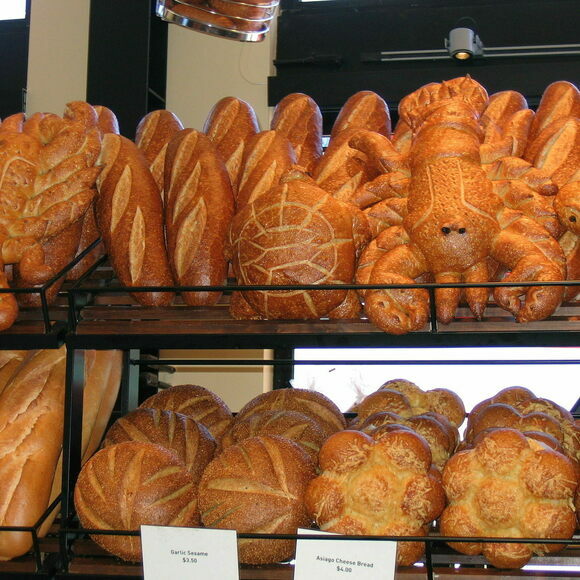 And the microorganisms that live in Boudin Bakery’s sourdough starter have been kept alive since 1849. Unlike other kinds of bread dough, sourdough uses naturally occurring Lactobacillus yeast in place of baker’s yeast. After Lactobacillus yeast comes into contact with dough, it begins to rise very slowly, creating the bread’s distinctive sour flavor. Because sourdough takes so long to rise, bakeries usually use a small amount of dough, called a starter, to keep the yeast alive rather than letting it rise all over again for each loaf. The starter can be stored in a warm, dark place and used to “start” each new loaf by adding a small amount to the fresh dough before baking. This means that some seasoned bakers and storied baking establishments own starters that have lived longer than anyone using them. Some families who have a tradition of bread-baking pass their starter down through generations, and at bakeries with sourdough traditions, the starter is a piece of living history. Boudin Bakery, the birthplace of San Francisco’s famous sourdough bread, is one such establishment. (San Francisco’s foggy climate allegedly produces superior yeast for sourdough.) Isidore Boudin founded the bakery in 1849 after arriving in the newly developing city of San Francisco to strike it rich. That same year, he collected the yeast that is still alive in the Boudin sourdough starter. The starter, also called the “mother dough,” is as old as the state of California, and predates the inventions of the airplane, automobile, telephone, radio, and light bulb. Boudin has many California locations, including a flagship on San Francisco's Fisherman's Wharf. Scientists say that yeast taken to a new environment will take on new characteristics, which is why Boudin's bakers say they ship each location 30 to 40 pounds of the mother dough monthly. Want to be sure you're tasting the real mother dough? Head to Boudin's historic location on 10th Avenue in San Francisco's Richmond neighborhood. The home of the sourdough starter.